None. Ageratum cannot tolerate cold temperatures. Thyme and Osteospermum. Dwarf types make good edging plants for beds and containers. Tall varieties often are grown as cut flowers. Sow tiny ageratum seeds atop moist seed starting mix and gently press them into the surface. Most gardeners buy ageratum seedlings, but only dwarf varieties are widely available as bedding plants. Space dwarf varieties 8 inches (20cm) apart in all directions; allow 12 inches (30cm) between very tall varieties. 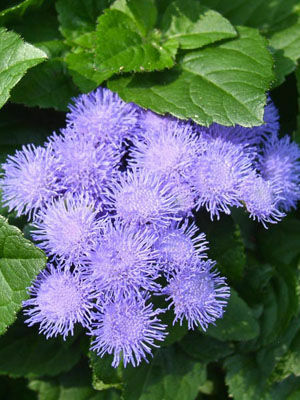 Blue ageratum provides excellent contrast when combined with flowers with orange blossoms. Some varieties produce white or pink blossoms. White ageratum blossoms go brown as they age, which is not as noticeable in varieties that bloom blue.